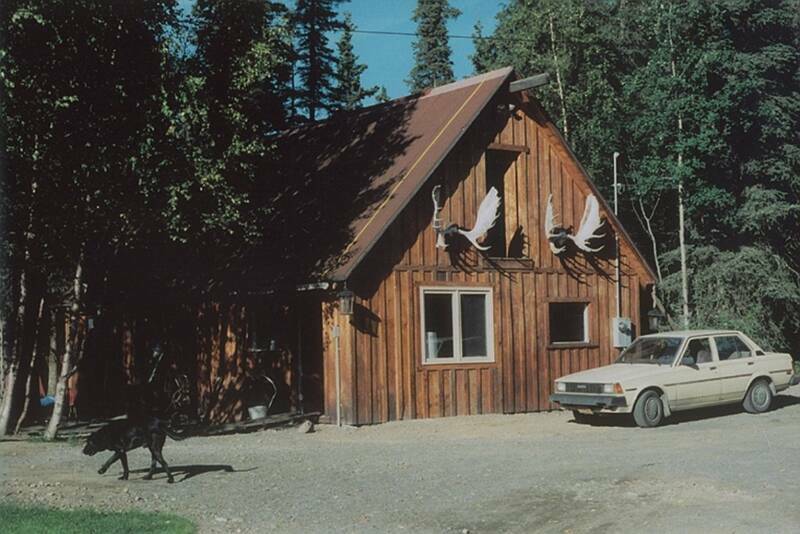 If you're looking for a special place to stay with the most authentic unique Alaskan lodging in all of the Kenai, you've found it! 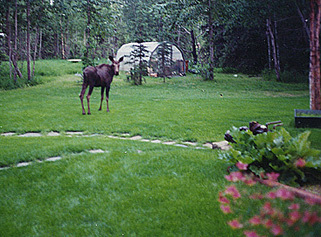 Our Homestead will make you feel like you are truly in Alaska every minute of your day. But don't expect to "rough it it’s old but it’s nice." The Homestead has been worked for over 60 years. 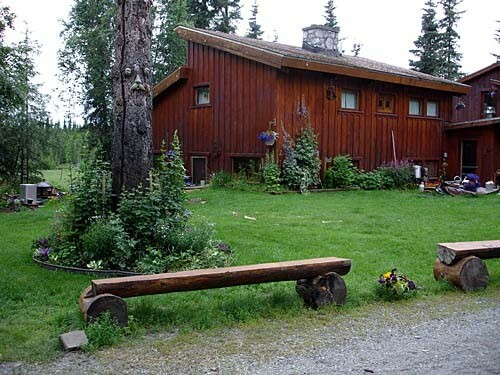 It sits on 160 acres with a beautiful green lawn and natural landscaping-it's lush & gorgeous so you can get a taste of local life on your Alaskan vacation. 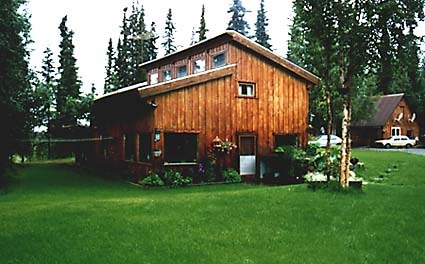 The Homestead Trophy Lodge provides a rustic exterior & interior and is truly a luxurious setting for a great Alaskan Fishing Experience! The Homestead Trophy Lodge is a spacious three bedroom two story home that we are sure you will enjoy. 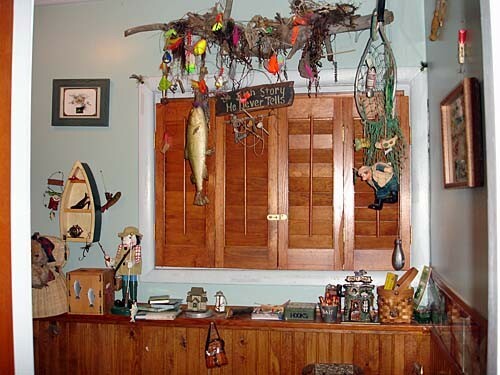 Our Fishing lodge specializes in catering to clientele who prefer a more personal and less crowded atmosphere. 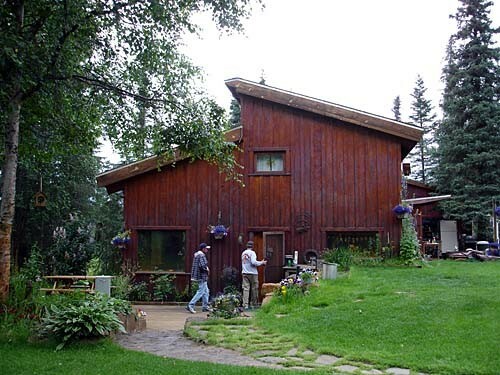 Our Moose Cabin is also a two story with three bedrooms. Each of our lodges will sleep up to six guest. 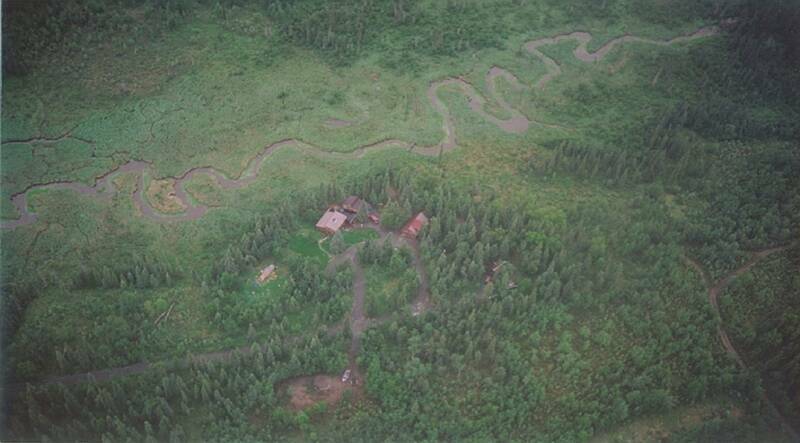 Our 160 acre homestead is located a quarter of a mile from the Spur Hwy. on Beaver Creek the main tributary running into the lower Kenai River. We are Centrally located between Soldotna and Kenai we are within 10 minutes of historic Kenai, with restaurants, grocery superstores and an airport. 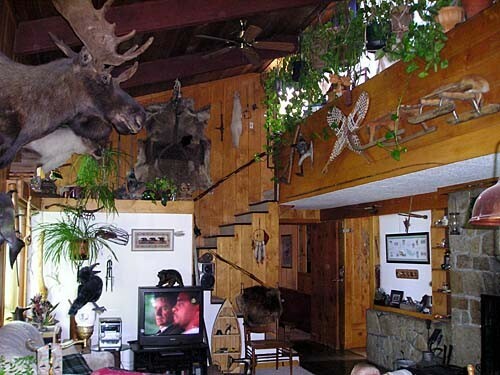 The Trophy Lodge is a three bedroom home. It has the kitchen, living and dining room and bathroom and one bedroom with a double and a twin size bed located on the main floor. There are also two bedrooms and one bath on the second floor. One room has two twin size beds and the other has a double and a twin. Sleeping six guest comfortably. There is a large wood deck out in front of The Trophy Lodge which over looks Beaver Creek. The deck is the perfect place to kick back in a lounge chair and relax with a good book, take in a bit of our magical Midnight Sun or relax after a day's outing. Guests can enjoy the outside lifestyle of the homestead with walkways to two large decks with lounge chairs, picnic tables, and log benches. There are many walking nature trails around the homestead, which boast almost daily moose sightings as well as plenty of other Alaska wildlife. 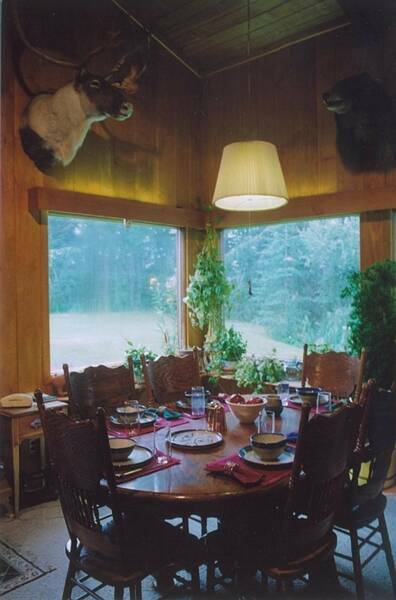 The main floor of the Trophy Lodge has a gourmet kitchen and a beautiful dinning room. It is complemented with a river rock fireplace with slate flooring and, comfortable Alaskana furnishings with a rustic theme. 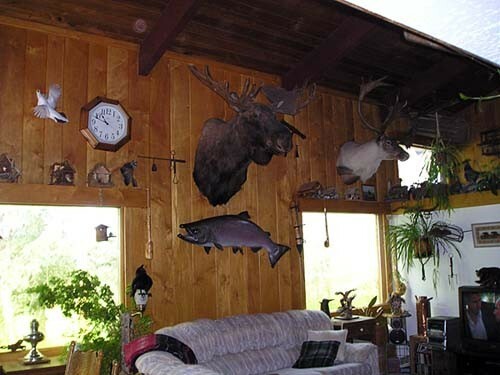 The living room features a high cathedral ceiling with a loft that nicely displays our trophy fish and big game mounts. There are endless antiques and Alaskan art. 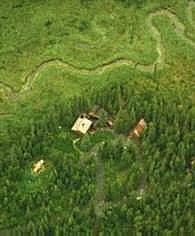 Right in the heart of south central Alaska's excellent salmon fishing and sightseeing country! We are centrally located between Homer and Seward, which allows you to stay in one comfortable location, yet have easy access to all the wonderful adventures that await you on "Alaska's Kenai Peninsula!". Both The Trophy Lodge and our Moose Cabin are truly Alaskan and are beautifully hand crafted from Alaskan Spruce; each one a special work of art. 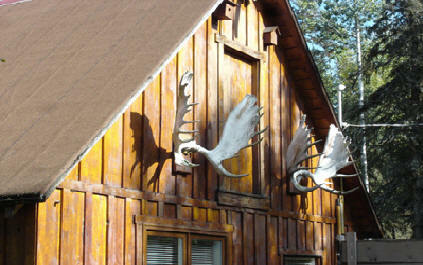 Native handcrafts and Alaska theme pictures adorn the walls providing a genuine Alaskan atmosphere. We do collect antique Fishing gear and here is a display of some of the rods in our collection that is continuously growing. The switchback stairs were built with drawers in each for extra storage. 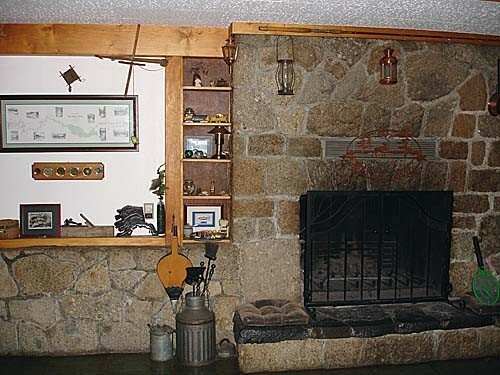 The stone rock fireplace with the black slate hearth were all hunted and hand gathered from the Kenai Beaches and the Kenai River. All of the handmade wood trim cabinets are all scribed and cut in perfect to match the stone work. Both cabins at The Homestead come complete with all of the amenities. We have cable TV, wireless Internet, and a washer and dryer and dishwashers as well. They each have their own private chest freezer for you to store your catch during your stay with us and BBQ grills for cooking up your days catch. Please ember the wildlife isn't visiting your neighborhood, you are visiting theirs. Don't forget to bring your camera as you will want to practice your photography skills on the fish, scenery and wildlife. This is Alaska, so what would it be without a bear passing through on his way to find a salmon dinner. 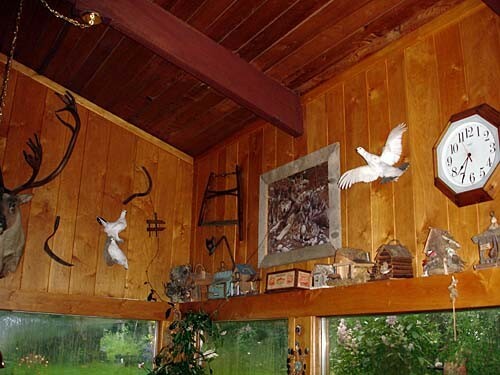 For the avid birder, there are several varieties of birds on the property. Bird sightings on the property include: common Redpoll's, Pine Siskins, Song Sparrows, Black Capped Chickadee, Chestnut Chickadees, Gray Jays, Red Breasted Nuthatches, Junkos, and Downy Woodpeckers. By just looking overhead, you’re likely to see Eagles, Hawks and Ravens soaring by. Sometimes I think it's all for the birds. We have endless bird feeders and houses around the homestead to attract the birds. Although I haven't seen the Ptarmigan and Spruce Hens on the wall fly in years now. 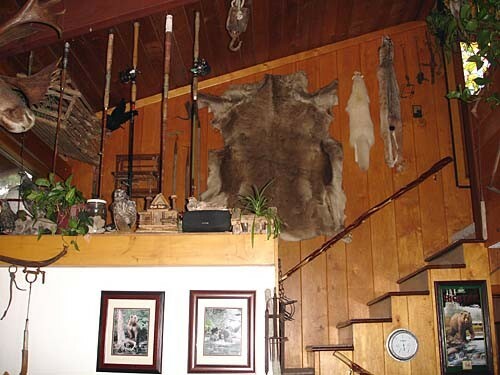 The living room has a high lofted wood ceiling that nicely displays an impressive collection of unique Alaskan trophies. The large windows all facing South-West let in all of the Summers light. 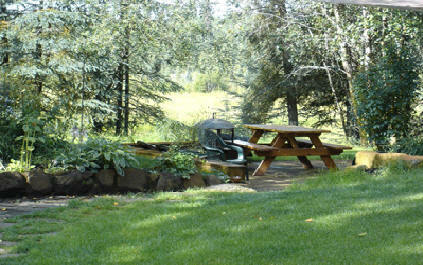 The wildlife viewing is superb overlooking prime waterfowl and moose habitat in the Beaver Creek drainage. Bears, caribou, moose, swans, geese, ducks, eagles, and beavers, all frequent the homestead. Fish are usually cleaned by your fishing guide at the river but we do have our own fish cleaning station down the hill where there is a small bridge that crosses over Beaver Creek to tempt you with some Trout Fishing. A complete full kitchen is also available for your use. We stock the kitchen with all of the fixings necessary and everything imaginable to prepare a gourmet break feast. The dining room next to the kitchen or the picnic table on the front deck are perfect for enjoying your meals at the homestead. The barbecue facilities on the front deck is all set up for you to grill up your up your catch of the day. The kitchen has top of the line stainless appliances with a dual fuel electric & gas stove, which can accommodate the chef in your group. 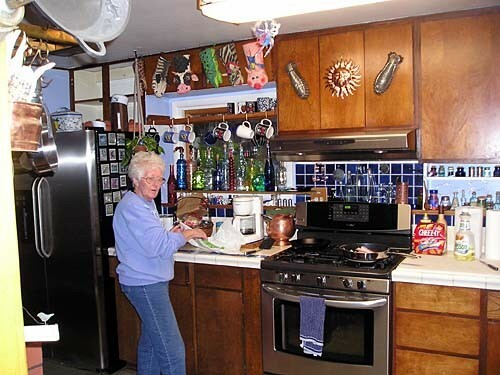 Here is a photo of my aunt Yvonne preparing up a feast when she visited us at the homestead. There is a full kitchen supplied with all of your cooking & kitchen needs with all of the utensils for the discriminating gourmet cook. We have plenty of dishes and silverware so you can get as extravagant as you wish. 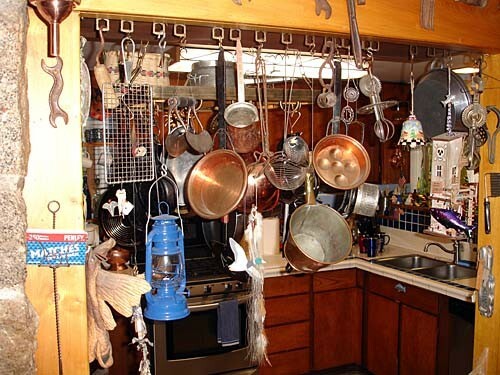 These pans are mostly ornamental in the photo but the hanging rack in the kitchen will hold some Teflon for cooking up your farm raised eggs from our chicken coop. The BBQ smoker grill on the front deck will compliment the arrangements and welcomes outdoor feasting. 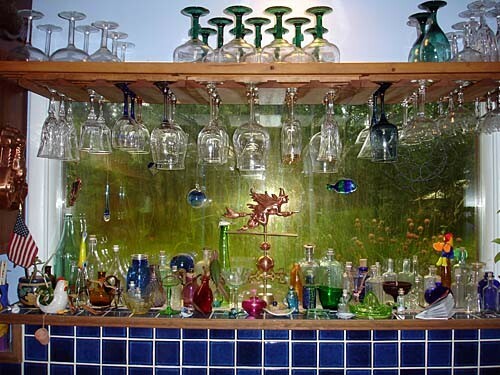 The wooden glass rack in the Trophy Lodge kitchen holds several different kinds of glass ware to complement a drink for all celebrations. All of our cabins come complete with fully equipped kitchens for preparing your meals. For those nights that you would not like to eat in we are a short 10 minute drive to the town of Kenai which has a large variety of restaurants to choose from or call ahead and most will deliver right to the homestead. This is just one off the walls in the downstairs bathroom. The Kenai River snag is continuously growing as it is enhanced with gear left behind from guest. I have noticed that there is a lot of very long contemplating that goes down in this room as it takes a while to finish the job of admiring ones treasures. 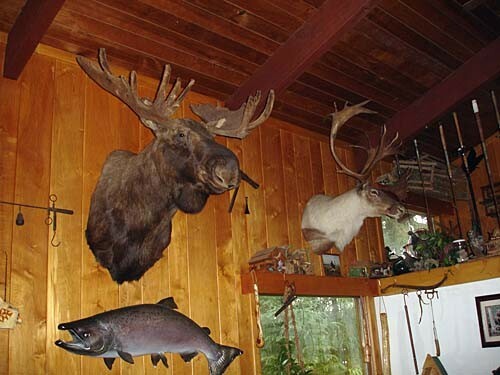 To accompany the Trophy Lodge we also have our Moose Cabin. This three bedroom cabin also comes with a fully equipped kitchen. The downstairs has a roomy wheelchair accessible bathroom. The third bedroom upstairs also has an additional private entrance with its own bathroom and kitchen. Our Homestead Moose Cabin was totally remolded for full wheelchair accessibility. It has a flush level entrance for roll in easy access. With an oversize 48 inch wide hallway and 36 inch doorways throughout there are no barriers. Their is a roll in shower stall and a shower chair if needed. We have many Fishing guest in wheelchairs returning to enjoy our homestead inside & out. 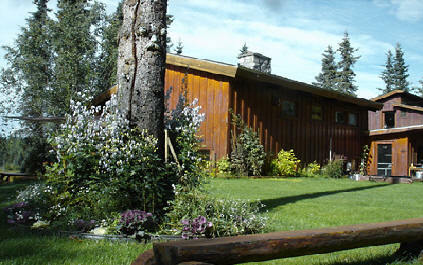 Our Moose Cabin is also a three bedroom when accompanied with the upstairs room the Bear Den. The kitchen, living room and dining room and two bedrooms and bathroom are located on the main floor. There are two twin beds in each room that we can easily made into a King size Honeymoon suite. The Bear Den can be accessed from inside the Moose Cabin and also can be occupied separately with its own private entrance. There is a twin bed and a fold out futon a bathroom and studio kitchen so that we can gladly even accept a single guest. Our outdoor fire pit is a great way to end the day sitting around the campfire, relaxing and sharing the day's experiences. Many guests will stop by the market and pick up the fixings for grilling some steaks, making a salad and enjoying a bottle of wine, or cooking up some very fresh salmon fillets they just caught only hours earlier. There is nothing that can compare to outdoor grilled sockeye salmon around a friendly campfire. 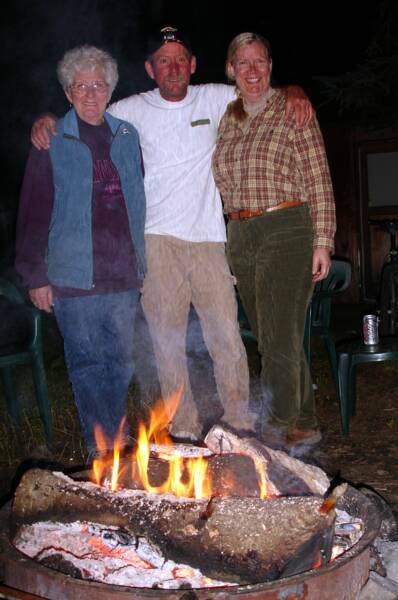 Here is a photo of my aunt Yvonne Scott & Laurie with bellies full of salmon after a great day of Fishing.